What do you get for your money in this high-end TomTom? If TomTom sets the benchmark by which other sat navs are judged, then life for the competition has been even tougher since the Dutch company introduced its Go 950 Live flagship last September. Slim, smart, powerful and packed with useful features, it's simply the best in class at what it does, but you have to pay for the privilege. 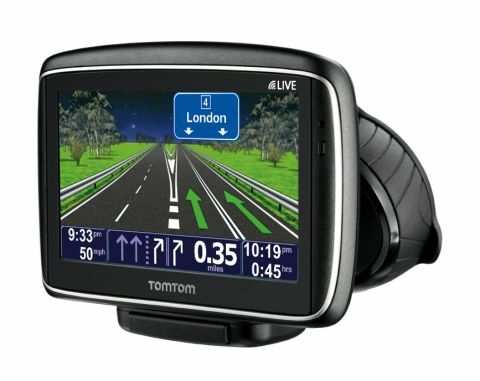 At £299.99 direct from TomTom, it's certainly far from cheap, although TomTom has attempted to sweeten the deal recently by offering one year's worth of free 'Live' services when you buy one, with subscription costs for subsequent years slashed by 50 per cent to £47.50. So what do you get your money? On the hardware side, the TomTom Go 950 Live includes a 11cm widescreen touch display with a resolution of 480 x 272 – the same as the Mio Navman 575 – with 4GB of internal memory and a microSD card expansion slot. The unit is slightly narrower, but thicker than the mid-range Mio Navman 575, measuring 12.7 x 8.5 x 2.3cm and weighing in at 224g. The unit is accompanied by an active mount dock kit, which enables you to attach the TomTom Go 950 Live unit to your windscreen much more securely than before. It also comes with a built-in mini-USB 2.0 port for charging up the TomTom Go 950 Live's three-hour battery using your car's 12v power socket. Since there isn't a USB 2.0 port on the unit itself (it uses a proprietary connector), TomTom's also thrown in a dock that means you can sync it with your PC or Mac – software for both platforms is included. Build quality is excellent and the matt finish on the TomTom Go 950 Live's screen makes it easy to see, even in bright sunlight. The really exciting stuff comes in TomTom Go 950 Live's features, which are packed with useful, stress-saving stuff for drivers, whether you're a 24/7 motorway mile-muncher or a casual weekend driver.